When measuring low conductivity samples, such as pure water, semiconductor cleaning water, boiler water, tap water, groundwater, river water, or rainwater, the value indicated by the meter indication is unstable, since these types of water contain only small amounts of impurity, resulting in measurements being easily affected by stains on the sample container or carbon dioxide in the air. The following methods solve this problem and provide more accurate measurements. 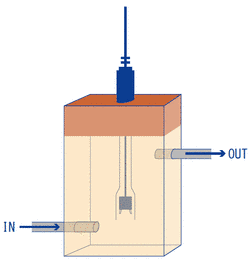 Fabricate a flow measurement container, as shown in the diagram below. Insert the whole cell into the shielded box and perform measurement. The system takes some time to respond, so wait until the meter indicates a stable value. 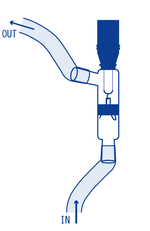 As shown in the diagram below, attach tubes to the inlet and outlet of the conductivity cell and feed sample liquid through it. To prevent the sample from coming into contacting with the air, nitrogen purges the sample tank containing the sample then seals it airtight. 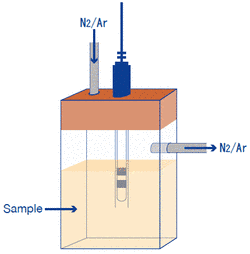 As shown in the diagram below, purge it with nitrogen or argon gas to prevent the sample from coming into contact with the air. Perform measurement inside a shielded box, as measurements are vulnerable to external electrical noise. The system takes some time to respond, so wait until the meter indicates a fully stable value. Stir the liquid slowly (at around 300 rpm). This will decarbonize all of the liquid.